her knowledge of evidence based practices which made it easy to build a trusting environment for the care of me and my baby. Bethany always took the time to talk, answer questions and just build trust and relationship. where I not only felt safe, but also felt that I would be listened to and could make choices for my birth and feel in control. I am so thankful that I found Bethany and look forward to hopefully working with her again! Thank you, Bethany! When we found out we were expecting, we immediately went to a local OB/GYN. I spent over half of my pregnancy seeing them and being pressured into procedures and told my baby would possibly not survive due to a misdiagnosed circumvallate placenta. The stress was becoming too much for me, and I was not allowed to see anyone outside of a nurse each visit. I finally found Bethany and she was such a blessing! She immediately gave me so much information and answered all of my questions regarding my pregnancy that, for the first time, I felt completely at ease with my pregnancy. She never pressured me into anything but offered expert information regarding testing and procedures; she also worked with me on a personal level and knew everything about me and my baby. During our prenatal care, birth, and postnatal care she was excellent in her knowledge and advice. I highly recommend Bethany as a midwife. In the process of completing the Bradley Method class series, my husband and I became concerned that we would be unable to have the birth we wanted with an OB group in a hospital setting. We were afraid that we would be pressured to accept medication or be faced with decisions that we were unprepared to make. We still wanted the reassurance of all of the resources a hospital has to offer, but we wanted someone on our team to back us up and be our advocate if needed. checking in to make sure all was well. She clearly cared about us and her support was incredibly reassuring. were the "real thing," but during a phone conversation, Bethany recognized that they were and we decided she should head our direction. than any of us realized and started the conversation about going to the hospital with Mike and then me shortly thereafter. she was even able to capture some photos of the first moments of our daughter's life, which we will always treasure. Before leaving, she helped with breastfeeding and made sure we were comfortable. I had some breastfeeding issues, and she provided several helpful tips both through the post-partum meeting and additional communication. Once again, it was very clear that she truly cared about us and our daughter. initially hesitant to hire a doula, it turned out to be one of the best decisions we ever made. Bethany was instrumental in helping us develop our birth plan, which was so educational as we approached my due date. When my water broke 2 weeks early Bethany met us at the hospital, and stayed with us the entire 19 hours of my intense, medication-free back labor! She never left my side and was such a comfort for both Jamie and I. She encouraged and supported me, and advocated for me when I asked her to. With her help we were able to achieve a successful, natural VBAC, one of the best experiences of my entire life. I know that Bethany's knowledge, skills, and compassion played a huge part in the birth of our sweet son, Oliver. Jamie, though initially reluctant, tells everyone about our doula and how grateful he is that she was there-- 19 hours is a long time for a weary husband to watch his wife in pain! Bethany was a wonderful part of our birth "family," and we are so, so thankful for her. My partner and I worked with Bethany Gates in the spring and summer of 2012. Kate was due at the end of June, and we wanted to have a natural childbirth if at all possible. We met Bethany at one of our weekly Bradley meetings in Cedar Falls, met with her to discuss our birth plan, and decided that we wanted her help with preparations, labor, and childbirth. I was very happy that we hired Bethany. She was knowledgeable, supportive, efficient, and caring. She met with us twice prior to Kate’s labor and delivery, and was in frequent phone and email contact as the due date approached. As questions arose from our end, Bethany was there with solid information to help us make decisions consistent with our birth plan. Her approach in helping us with decision-making was always to provide information and guidance, and never to push us toward any one particular kind of practice or procedure. We were concerned that during the intensity of labor and childbirth we might feel pressure from the hospital’s medical staff to accept a course of action that we didn’t want, and Bethany’s presence always made us feel as though we could conference with a knowledgeable, supportive ally before hasty decisions were made. Bethany met our highest hopes and expectations throughout the day of labor and delivery. Kate went into labor in the very early hours of the morning, and by noon we were heading to the hospital. Bethany had been in contact with us from roughly 9am until we met her at the hospital. She was an indispensable presence in our labor and delivery experience from the moment we saw her waiting for us in the lobby. She knew how to massage Kate’s back, how to navigate policies suggested by nurses, whether and when to try different laboring positions, and so forth. As the partner to the birthing mother, I was thankful for Bethany’s presence at every turn. Much of the process was overwhelming, and my ignorance was made apparent to me early and often. Having Bethany there allowed me to recover a needed feeling of competence and control. Not only were her particular gifts, training, and strategies enormously helpful during labor and delivery; but her presence also allowed me to take brief breaks in order to use the restroom, eat a sandwich, and so forth. These sound like trifling benefits in retrospect, but it strikes me as important to have a trustworthy ally close at hand during those moments when the birthing mother’s primary support person cannot be present. Bethany’s strong work ethic, care, and expertise were evident when we met with her a week after our daughter was born, as well. 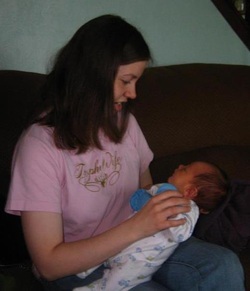 Bethany included a post-partum breast-feeding support session in her services. For this session she came to our home, asked us questions, offered helpful suggestions, and gave us a typed review of our day of labor and delivery. To me, this post-partum session shows that Bethany’s care extends beyond the central work of childbirth, and indicates her dedication to the health of the mothers and infants with whom she works. Her typed review of our day provided a wonderful third-party perspective on the most important day of our lives, and is something that Kate and I will return to as our daughter grows older. I give Bethany my highest recommendation. Her work as a doula gave us confidence, and put us at ease throughout what could have been an overwhelming and difficult day.